The Tau-Lepton Physics Group aims to comprehensively understand the standard model of elementary particles (the Standard Model for short), to elucidate the origin of particle masses, and to search for new phenomena beyond the Standard Model, by using the top and bottom quarks, as well as the tau lepton as exploratory probes based on the experimental data collected by the ATLAS experiment currently conducted at the European Organization for Nuclear Research (CERN) in Switzerland and the B-factory experiment at the High Energy Accelerator Research Organization (KEK) in Japan. These three particles belong to the third generation of elementary particles, which are expected to be highly sensitive to physics phenomena beyond the Standard Model (new physics). In research on tau lepton decay phenomena, this group is searching for tau lepton decays that are forbidden in the Standard Model but allowed in the new physics. New physics hidden behind the Standard Model will be explored by analyzing tau lepton decay data produced and collected by the B-factory experiment that has achieved the world-highest statistics. Figure. A typical decay process of tau lepton (τ→μγ) in new physics. An undiscovered particle is thought to mediate this decay in the virtual intermediate state. In research on B mesons, which contain bottom quarks, the group continues carrying out measurements of the Kobayashi-Maskawa matrix, which have led to the Nobel Prize of Drs. Kobayashi and Maskawa, as well as energetically pursuing new physics phenomena. Along with studying the tau lepton, this group is also exploring new physics by applying original ideas to analyze B-mesons data with the world's highest sensitivity, which have been collected by the B-factory. Figure. The decay process of a charged B-meson into tau lepton and neutrino. 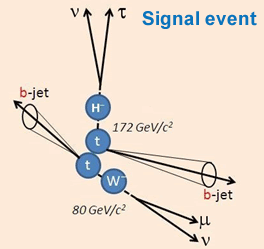 W bosons, which mediate the weak interaction, are in general involved in this process; however, the undiscovered charged Higgs particles are also expected to contribute to this process. The group is examining various phenomena measured by the ATLAS experiment currently conducted at CERN. In particular, direct detection of undiscovered new particles is being pursued by making the most of the world's highest energy available at the experiment, with a special emphasis on phenomena related to the top quark. The top quark, the newest elementary particle discovered in 1995, needs to be studied further to precisely determine its physical properties and thus is a research target of this group. Figure. Pair production of top quarks and their decays: one of the top quark decays through a charged Higgs particle. This event is particularly interesting to us as it involves all of the particles on which we focus - the top and bottom quarks and the tau lepton. The goal of the Fundamental Astroparticle Physics group is to integrate the investigations of the universe and elementary particles, including cosmic rays, cosmic dark matter and neutrinos. These studies are at the forefront of elementary particle physics and cosmology. Cosmic rays are the radiation which showers the Earth from outer space. What is the maximum energy of cosmic rays? 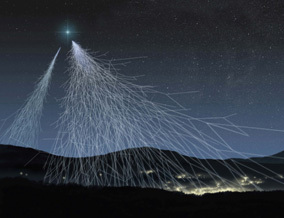 Recent observations revealed cosmic rays with extremely high energy of 1020 electron volt, which is eight orders of magnitude higher than that can be achieved by any currently available accelerators on Earth. This finding is known as the "ultra-high energy cosmic ray problem." The universe is filled with photons called cosmic background radiation left over from the Big Bang. If the energy of cosmic rays exceeds 4 × 1019 electron volt, they should collide with these photons to lose energy before reaching Earth. If this observation is correct, something that we have never imagined, such as the violation of the theory of relativity or reactions of exotic elementary particles, may take place somewhere in the universe. However, determining cosmic ray energy is not easy. When cosmic rays collide with air, numerous secondary particles are produced as an "air shower." Cosmic ray energy is estimated from the measurement of these secondary particles, but the relationship between cosmic ray energy and secondary particles is not well understood. Clarifying this relationship is the main purpose of the LHCf experiment. The LHCf experiment was proposed by an international collaborative research group including the Solar-Terrestrial Environment Laboratory of Nagoya University and began data collection during the initial operation of the LHC. The LHCf experiment (f means forward) is dedicated to detecting very forward-scattering particles by colliding protons or nuclei, accelerated to high energy, head-on. Carefully examining particles scattered into the very forward region is key to understanding the air shower phenomena. Through analysis of the experimental data collected by the LHCf experiment, we expect to not only understand elementary particle interactions at extremely high-energies, but also to solve the ultra-high energy cosmic ray problem by confirming the measurement of cosmic ray energy of 1020 electron volt. Figure. 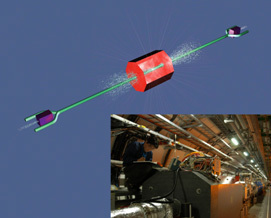 Schematic view of the air shower produced by high-energy cosmic rays (left) and conceptual diagram of the LHCf experiment (right). The LHCf experiment aims to detect particles scattered into the very forward regions upon the head-on collision of protons or nuclei. There are about 300 neutrinos per cubic centimeter in the universe, and hence exploring neutrino properties is important to understanding the evolution of the universe and the origin of matter. Although neutrino masses were assumed to be zero in the Standard Model; however, through the neutrino oscillation theory proposed by Maki, Nakagawa, and Sakata of Nagoya University, neutrinos are known to have masses. In neutrino oscillations three types of neutrinos (electron-type, muon-type, and tau-type) could turn into one another. This phenomenon was first confirmed by the Super Kamiokande experiment through the observation that muon neutrinos actually transformed into other types of neutrinos in atmospheric neutrino experiments. The group is also conducting another experiment called "OPERA," which aims to confirm neutrino oscillations by directly detecting the tau neutrinos produced through the oscillations of the muon neutrinos. The OPERA experiment, situated 730 km away from CERN, where an accelerator produces muon neutrinos, is designed not to measure the reduction in the amount of the muon neutrinos but rather directly detect tau neutrinos converted from the muon neutrinos through the oscillation. It is, however, not easy to detect or identify tau neutrinos. The only promising method is based on the use of the nuclear emulsion technique developed in Nagoya University. In the OPERA experiment, one candidate event of tau neutrino production has been successfully observed using nuclear emulsions with the total surface area of 100,000 m². 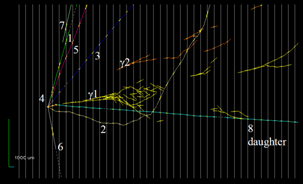 The definitive conclusion on neutrino oscillations is expected with a larger number of events. Moreover, the group plans to apply its proprietary nuclear emulsion technology to other research areas such as the search for dark matter. Figure. Conceptual diagram of the OPERA experiment (left). 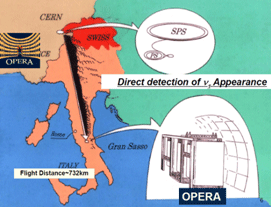 Muon neutrino beams produced at CERN are detected by the OPERA detector placed 730 km away. Interactions of the tau neutrinos transferred from the muon neutrinos are detected by nuclear emulsions. The figure on the right shows the first such event observed in 2010.